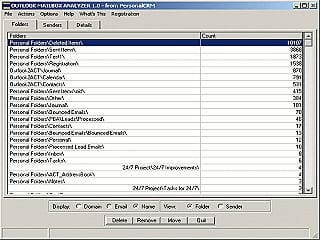 Outlook Mailbox Analyzer can find and analyze the Outlook mail on a single interface. The program quickly identifies the number of Outlook items in each folder at the same time. You can view and manage all the elements for each domain name or e-mail to the entire system. Quickly identify the number of Outlook items in each folder simultaneously. The software is a shareware version which expires after 15 days of use. You need a minimum of requirement system on your computer. Rapidly find emails, regardless of how deeply they are buried in you folder structure. Quickly identify the number of Outlook items in each and every folder, simultaneously. Easily see the total number of items for each domain name or email address for the entire system or just selected folders. Quickly identify the locations for one, some or all sender domain names or email addresses. In one step, easily move all items of a selected domain name or email address into one centralized folder. Or simply remove them from your system.